Paperback, 9.25 x 11.5 in. / 288 pgs / 504 color / 8 bw. Edited by Marta Herford. Text by Friederike Fast, Andrea Jahn, Beral Madra, Roland Nachtigäller. This publication accompanies the first major museum retrospective of the performance artist Nezaket Ekici (born 1970), held at the MARTa Herford art museum in Germany. 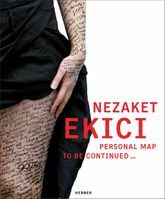 A former student of Marina Abramovic, Ekici challenges gender roles and the Muslim traditions of her native Turkey in performance pieces that range in tone from playful to disturbing. Text by Nezaket Ekici, Mark Gisbourne, Joachim Blüher. FORMAT: Pbk, 9.25 x 11.5 in. / 288 pgs / 504 color / 8 b&w.